Atlas Learn announces its official launch with the premiere of an in-classroom amplified learning system. This patent pending Amplified Learning System, ALS, is designed for use in K-12 and higher education facilities or where a room constrained public address system is required. The ALS is a complete audio enrichment system consisting of amplifier, wireless microphones, and docking station. The teacher and students are able to walk freely around the room with the infrared microphones/system control units and project their voices through installed speakers. The AL2430 pendant / handheld microphone transmitter allows both teachers and students freedom of movement without bulky electronics or cumbersome wires. The dual mode transmitter allows teachers to control microphone volume, overall system volume and mute settings via side mounted soft touch controls. In addition, when panic and mode controls are pressed simultaneously for three seconds a contact closure is triggered on the AL2430 receiver. This contact closure may be integrated with most any intercom or IP based notification system to signal an emergency condition in the classroom. When transmitter is configured for student mode operation, all controls are bypassed restricting the device’s functionality for use as a wireless microphone only. 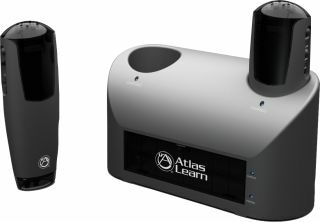 Atlas Learn’s Infrared Microphones are capable of transmitting on one of two dedicated IR channels to allow a teacher and student response microphone to be used in the same space without interference. Each microphone has three signal transmit emitters to guarantee reliable use with no drop-out whether the microphone is being handheld, on belt with external microphone connected, or on a lanyard. With a hinged belt clip and ID mounting clip, the microphone in any position is lightweight and comfortable to use. Visit Atlas at Infocomm booth 6201.